These 3 Antique Chess Sets Prove That the Old Styles Still Hold Up! Reviews of our favorite vintage chess sets and things you should consider before buying one. 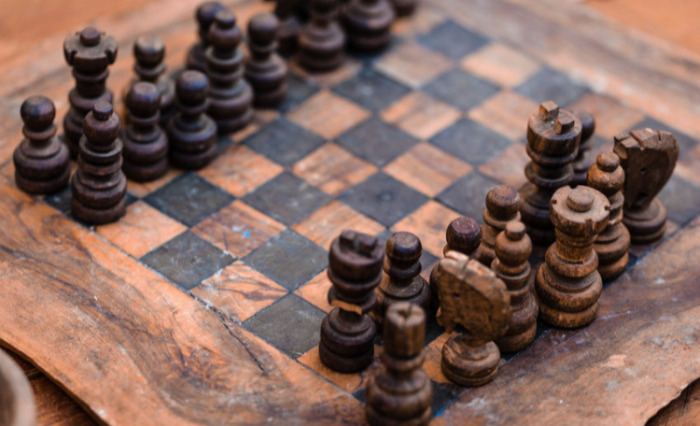 Although the phrase “antique chess set” may conjure up an image of a plain wooden chess board, there is actually a lot more variety to be found than that. And, it’s important to note that some materials will hold up better over time than others. If you’re buying a true antique chess set, make sure that the material it’s made from can stand the test of time. Older items can often need more maintenance than new items to keep them in good condition. This will also be dependent upon the materials of your chess set, but make sure to take into account any ongoing maintenance an antique chess set will need before buying. If you’re expecting an antique chess set to be less expensive than a more modern one, you may need to think again. The phrase “they don’t make them like this anymore” can very often apply to chess sets, meaning that you can get a higher quality vintage set (at a higher price) than buying new. 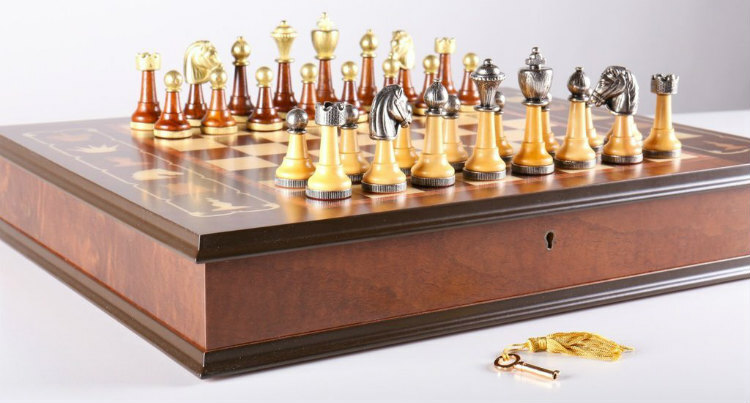 This luxury chess set is one of the most beautiful antique chess sets available in 2019. It was designed by Frank Camaratta himself and has an antique style that is simply breathtaking in person. 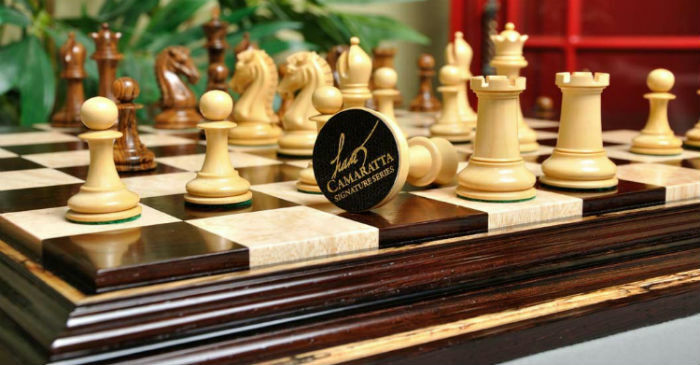 The chess pieces included with the Camaratta Signature Series Cooke Chess Set are modelled after the classic Staunton pattern for the most part, with the added twist of the Maestro’s Knight design as featured in that Craftsman set. The combination is striking, and it’s surprising that the different pieces work so well together, but they do – and none stick out as being a noticeably different style from the others. Each piece is hand carved from either bocote or natural boxwood. 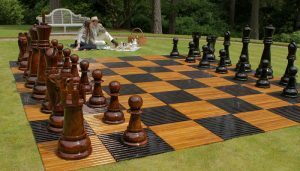 These woods are less commonly used for chess pieces, and therefore they give a pop of unexpected color to the vintage chess set. 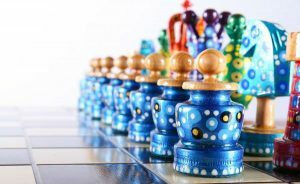 The chessmen have a unique look to them, from color, to shape, to finish that imparts a unique vintage style to the whole chess set. The King piece is 3.625 inches tall with a 1.75 inch base, and they both feature an English leather base pad that is embossed with Frank Camaratta’s signature. The chess board included with this old fashioned chess set has a footprint of 22.5 inches by 22.5 inches and features 2.25 inch squares across its playing surface. The dark squares are made of African Palisander wood, while the light squares are carved Birds Eye Maple. The board also features a spalted maple border with detailed inlays and corners around an African Palisander frame. The contrast between the woods makes for a beautiful and highly unique looking chess board. The final piece of this antique style chess set is the chess box that keeps all the pieces safely stored while they’re not in use. The box is available in your choice of woods, and it features contrasting inlaid accents, reinforced brass hinges, green baize lining on the interior, a lock with tasseled key, and the House of Staunton laser engraved onto the lid. 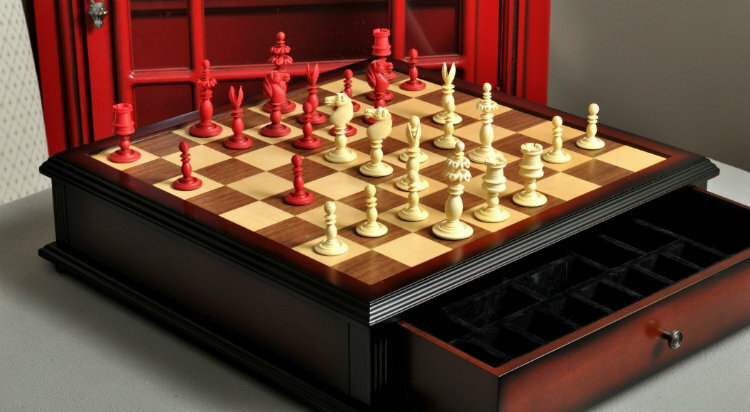 Your pieces will be kept safe in style in this chess box. This exquisite chess set is made in the famous Italfama in Italy, one of the most prestigious manufacturers of chess equipment in the world. 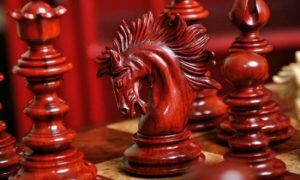 It is renowned for making high quality, luxury chess sets, and The Florentine Di Scacchi Luxury Home Set is no exception. Italfama was established in 1976 by Aldo Marsili as a hobby business that quickly caught on. Over the past three decades, the Marsili family has worked to maintain this business along with its high level of excellence, all the while honing their craft and producing some of the finest chess sets ever made. This fine antique chess set pairs two luxurious materials – metal and wood for a combined effect that is simply breathtaking. The vintage style of the chess pieces is accentuated by the sleek wooden bodies with metal tops and bases. The King piece stands 3 inches tall with a 1 inch diameter base. Anyone with an old-fashioned sense of style will find this beautiful chess set a perfect match next to antique furniture and decor. The Florentine Di Scacchi Antique Chess Set also comes with a 17 5/8″ x 13 3/4″ x 3″ chess board/box combination. The actual playing surface is 11 inches square, with 1 ⅜ inch squares. The expertly crafted antique chessboard opens up on hinges to reveal an interior storage area where the vintage pieces can be kept when not in use. The box is also lockable, and the set comes with an ornate key with a small tassel that is really the cherry on top of this beautiful vintage chess set. 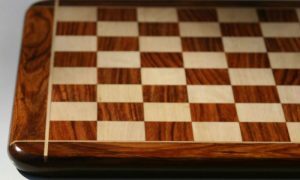 The board is very elegant and it is made from the finest maple, walnut, mahogany, and briarwoods with decorative inlays in the old style. This whole set exudes antique elegance, and with the proper care, it will last for generations and become a beautiful heirloom in your family. 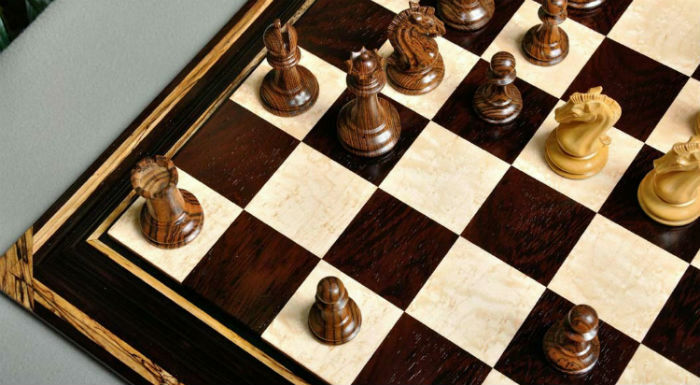 If you’re looking for a unique chess set that embodies the antique style while still being brand new, look no further than The Calvert Chess Set and Board Combination. This vintage chess set has a definite vintage vibe to it, and its design is closely based on a real set made in 1810. The original old set was known as the Calvert Pattern, a design that is often mistakenly credited to John Calvert. The slim, tall stems of the pieces, the unique design of the 3.5 inch tall King and slightly shorter Queen pieces, and the red color of Black’s army are all hallmarks of chess design in this era. 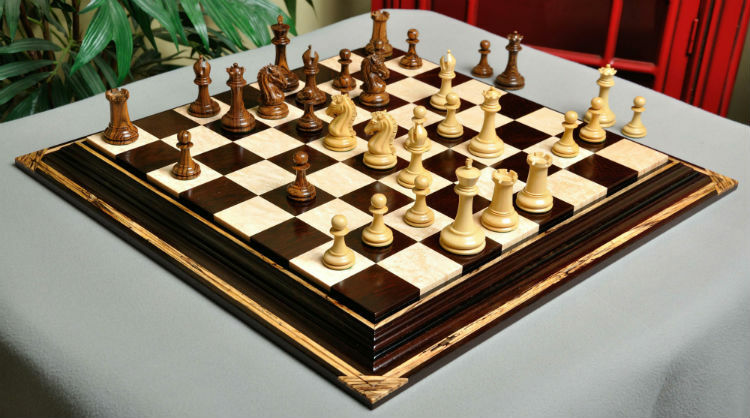 The Calvert Chess Set and Board Combination is one of the best antique chess sets for sale right now because it offers such a great value for the money. 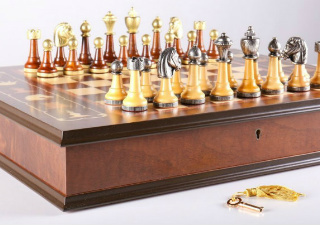 At a surprisingly low price, you get a genuine reproduction of a very unique antique chess set, as well as a Classical Tiroir Display Chessboard to keep the pieces protected an organized while in storage. 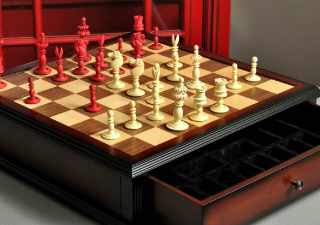 The chess board features two interior storage drawers that are padded and divided in order to provide a unique slot for each chess piece and prevent them from bumping into one another and becoming damaged or chipped. 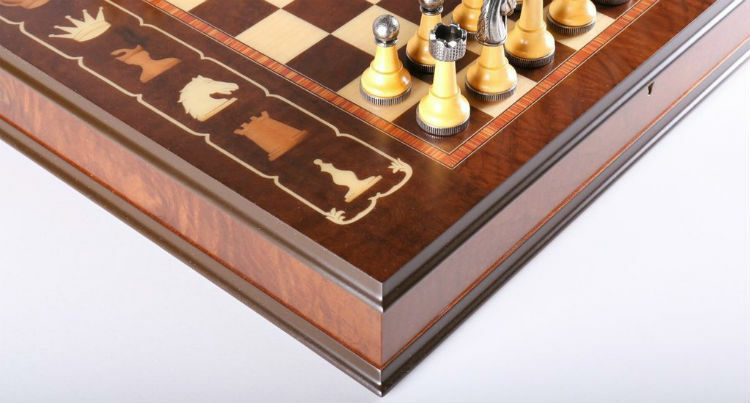 The chess board/chess box combination piece is made from walnut and maple woods inlaid in a Cherry wood frame. The combined result is quite striking, and provides the perfect backdrop for the antique chess pieces included with this old fashioned set. 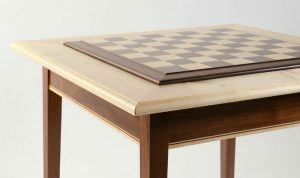 The chessboard is 17.5 inches square and has a depth of 4.5 inches in order to accommodate the interior storage drawers. Each individual square on the surface of this chessboard is 1.75 inches, which provides the perfect amount of room for the vintage chess pieces. 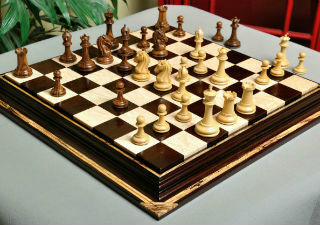 This is a great set for anyone wanting a luxurious and authentic vintage chess set. As mentioned above, the material your vinatge chess set is made of will determine how well it will hold up over time. If this is an old fashion chess set that you’ll want to pass down to your children, you may want to spring for something more durable than plastic, for example. Natural stone, metal, and wood that’s well cared for are all materials that can last and last. Before buying any chess set, consider how much work you’re willing or able to put into maintaining it. Some materials will require minimal care and cleaning over the years, while others will be a lot more demanding. You’ll want to know which is which before you make a commitment that you may not be able to follow through on. Cost is always a factor in any purchase. 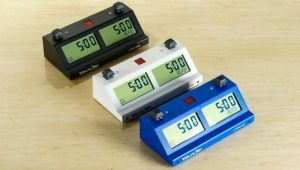 When deciding on your budget, consider not only what you can afford, but also what you are willing to pay for an antique chess set and what is reasonable to pay for a certain quality of product. If you commit to spending a lot of money on a chess set, you’ll want to make sure that you’re getting a high quality product and not just overpaying for a piece of junk. 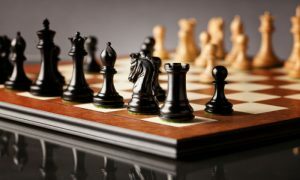 In fact, that’s why we put together these lists of recommended chess sets that stand for sale – to make sure you get the most possible bang for your buck without being ripped off.